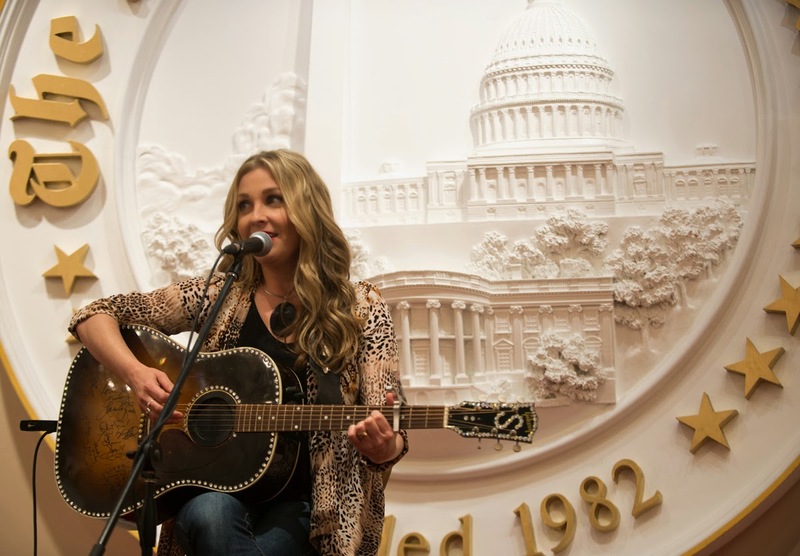 WASHINGTON, D.C. – April 29, 2015 – When acclaimed country singer and songwriter Sunny Sweeney was invited by The Washington Times to perform at their private event for Wounded Warriors’ caregivers and attend The White House Correspondents’ Association Dinner as a guest of The Washington Times, Sweeney swiftly obliged. An avid supporter of the armed forces and wife of an Austin Police Department sergeant, Sweeney was honored to have the opportunity to thank those servicemen and women who serve as well as their caregivers. On Friday, April 24, the ACM New Artist of the Year nominee performed songs including her recent Texas chart-topping single “Bad Girl Phase,” as well as her current heart-wrenching ballad “My Bed,” which is currently No. 3 and No. 6 on the Texas Regional Chart and Texas Music Chart respectively, among others. After performing, Sweeney met with Wounded Warriors’ caregivers and veterans to thank them for their support. The Times partnered with the Freedom Alliance, the Elizabeth Dole Foundation, Mission BBQ and The Washington Redskins Salute program for the private event for veterans. The following evening, Sweeney attended the White House Correspondents’ Association Dinner, commonly known as the “nerd prom” as The Washington Times’ guest. Sweeney wore a gown by Jovani. “It was an honor and a career highlight to be able to go to such a once in a lifetime event and I cannot thank The Washington Times enough for including me,” Sweeney expressed. The weekend of events in the nation’s capital was a very moving one for Sweeney. Having recently performed at the CPAC and NRA conventions, Sweeney strives to be an involved citizen and patriot throughout the country. Sweeney places great value on those who serve, and those who care for the country’s service men and women; Sweeney’s family stems from a long line of relatives who have served in various branches of the military, including her husband’s service in the US Air Force. Sweeney, who most recently toured with Miranda Lambert, is set to play Love City Country Music Festival in the U.S. Virgin Islands on May 16 as well as the Bud Light Plaza Stage during CMA Fest in Nashville, Tenn. For a full list of tour dates, visit www.sunnysweeney.com.